Gundar Pak / Paak - Edible Gum Fudge is a traditional Gujarati delicacy which is often prepared during the winter season. These exotic and unique taste bars consists of Bawal/Baval Gundar or gond ( edible gum ) ghee, jaggery and lots of special herbs and spices. In Gujrati kitchens Katlu, Methi Ladoo, Vasanu or Gundar Pak these are the few of the winter warmer delicacies which are prepared exclusively when the mercury drops. These sort of recipes were devised by our ancestors to serve as a delicious tonic to keep the body in good condition during harsh winters. All these hearty and homemade winter foods are wholesome, comforting and make you feel so good in the frigid winter months. The sweet and mildly spicy winter warmer dishes that are herbal recipes fortifies the immune system and energises it. Traditionally these winter warmers are eaten at breakfast with a glass of milk. Gundar Pak is one of the most popular winter delicacy made in Gujarati kitchens. 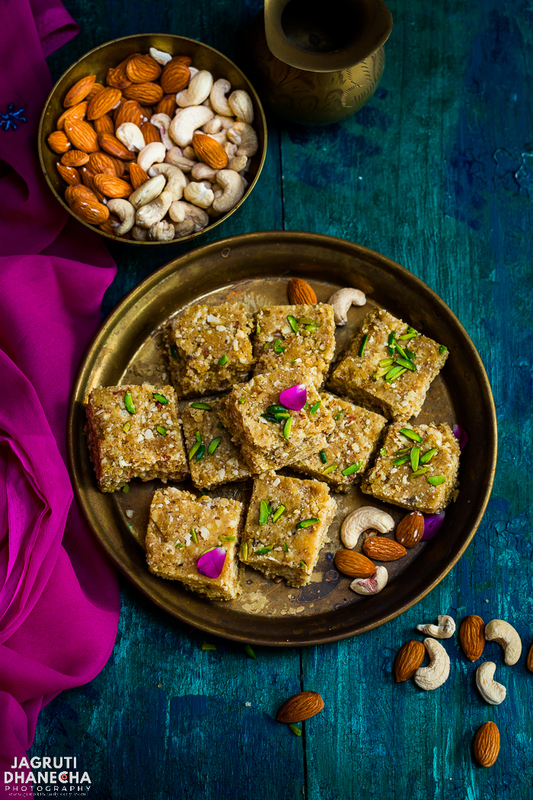 It is tasty and rich, the wholesome energy bar is prepared with edible gum, ghee, jaggery or sugar and special herbs and spices. It has this unique but sharp intensity of flavours, but one can get used to so quickly. The Gundar pak not only popular in Gujarat but across north Indian states like Rajasthan, Haryana, Uttar Pradesh, where winter are so harsh. Every region has their own recipes and method of making Gundar Pak, but let me tell you the end product is so mouthwatering and nutritious. Some Gundar Pak recipes include milk, sugar, mawa ( milk solids ) in some wheat flour and jaggery. My recipe is without sugar, milk, mawa and wheat flour. Gundar, Gond or Gondh is an edible gum that is sourced from plant gums derived from the Middle Eastern legume or acacia plants. This gum producing plants are found in the Middle East, Rajasthan, Punjab and parts of Gujarat. It is tasteless and odourless. According to our ancestors and ayurvedic health experts, Gundar has many nutritional and ayurvedic health benefits. It is great for boosting immunity, stamina and health. Gundar is also ideal for nursing mothers. Gundar / edible gum which is available in any Indian grocery store. It is available in 100g, 200g packets and in crystal form. Ghee is a second must item in this recipe, use homemade desi ghee. Vegans can use coconut oil or dairy free butter. Jaggery, if you are preparing this dish in the winter season, use fresh Jaggery that is available at this time. The colour of your Gundar Pak depends on which jaggery you have used. Spices and Herbs, In Gundar Pak, dried spices and herbs are must. You can either buy whole spices and make powder at home or get readymade. If you don't want to buy a different powder then just get KATLU or BATRISU MIX powder, it will do the same job. Again rich and protein packed nuts are necessary for the Gundar pak, it won't matter which one you use but mostly in Indian households cashew, almond, walnuts and pistachios are used. HOW TO MAKE GUNDAR PAK? There are a couple of methods for this recipe. In most of the Gujarati households, Gundar is soaked in melted ghee of at least 12 hours before using it in this recipe, wherein other regions Gundar is directly fried in ghee. Both methods work perfectly, but in my recipe, I have combined both methods, let's see in the pictures. Making Gundar Pak is not a tedious job but slightly time-consuming, also keep a couple of tips in mind when you prepare a jaggery syrup then you are all set for a delicious and irresistible Gunadar pak! First, grind the Gundar till you get a fine powder. Melt ghee in a pan and add all the gundar powder, mix well and cover it with the lid and keep it aside for minimum 12 hours at room temperature. Next day lightly roast the nuts and grind into the coarse powder. Lightly roast the desiccated coconut. Cut the jaggery into the small pieces or grate it. Grease one tray and keep it aside. Heat ghee in a kadai and fry the leftover gundar crystals. Keep it aside and mash it with your hands or a small stainless steel bowl. In the same pan, add a couple of tablespoons of ghee, and add grated jaggery. Keep the heat on low and let the jaggery melt completely, once you see the bubbles appear, add roasted nut powder, coconut, all the herbs and spices, white poppy seeds, raisins, nutmeg and green cardamom powder. Quickly mix everything, then add soaked and fried gundar and combine all together. At this stage, the mixture will get thick so quickly, and there is a chance that the mixture will stick to the bottom of the pan or kadai so work quickly. Transfer the Gundar pak mixture into the greased tray, and level and press it with the back of the spatula. Sprinkle pistachio slivers ( if using ) and press it again. Leave it to cool for 40-50 minutes then cut into the desired shape. Let the Gundar Pak completely cool then store in an airtight container. Have one big piece at breakfast time with a glass of milk or tea. Gundar Pak/paak is a traditional Gujarati delicacy that is mostly consumed during winter months. These wholesome and delicious bars prepared with Edible gum, nuts and various herbs and spices. Too good to miss! In a grinder, grind gundar till you see fine powder. Sieve through the wheat flour sieve, still, there will be some small gundar pieces, leave it aside. Melt 200g ghee in a pan, add sieved gundar powder, mix well and leave it aside for 12 hours at room temperature. Lightly roast the nuts and coconut, grind it till you get a coarse mixture. Keep it aside. After 12 hours, make Gundar Pak. Heat about 30g ghee in a kadai, fry the leftover gundar pieces. Transfer in another plate and smash it with your hands or a bowl. In the same kadai, add more ghee and jaggery. 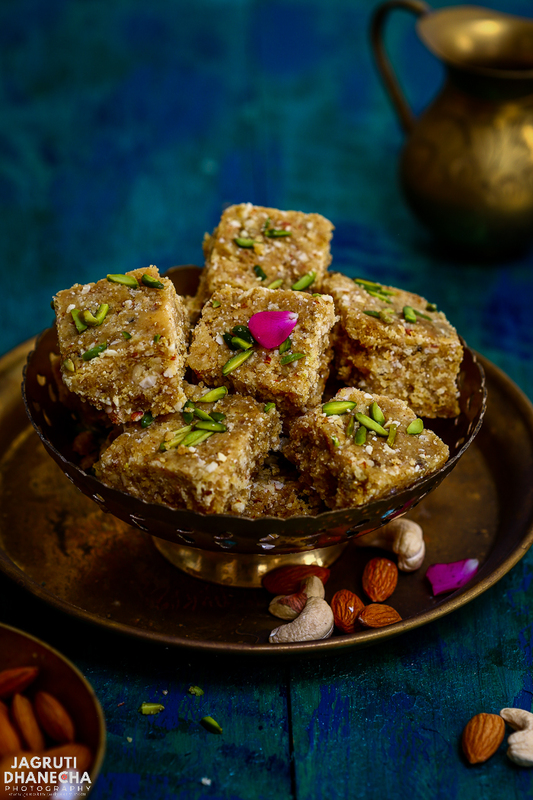 Let the jaggery melt completely, once bubbles start to appear in the syrup add raisins, nut and coconut powder, katlu powder, cardamom and nutmeg powder and poppy seeds. Mix everything quickly, then add soaked and fried gundar into the jaggery mix. Combine everything quickly and pour the mixture into the greased tray or thali. Sprinkle pistachio slivers if using. Let it cool for a while, cut into the desired shape. Have a one piece every morning with a glass of milk or tea. Instead of katlu powder you can use dry ginger powder, Soonth or Ganthoda Powder, Piprimul powder and Mari ( black pepper ) powder. I was so excited to see the Gond tree on my trek through the Sahyadris. It is such a valuable addition to the diet and love your recipe. It is not only a winter warmer the addition of coconut and nuts and all things nice makes it so superior. Thanks MI. I am yet to see Gundar tree! I can't stop drooling at those fudge squares... looks amazing, and totally worth the effort! Thanks Rafeeda, agree worth the efforts as it tastes awesome and nutritious too. that looks totally droolicious jagruti! Such delicious ingredients and the final fudge looks so tempting! Gorgeous clicks too that makes it totally Irresistible!